Among the various measures of heart health are blood pressure and cholesterol levels—but you must also pay attention to triglycerides. These are a type of fat found in the blood, and high levels are a risk factor for heart disease. Consequently, lower triglyceride levels is one of the approaches that should be included in any heart-healthy lifestyle. Fortunately for anyone who’d prefer not taking drugs, it is possible to use lifestyle changes and improvements to lower triglycerides without medicine. Why Do Triglycerides Matter, Anyway? High cholesterol is a problem because it can form plaques and impede blood flow. Triglyceride levels matter because they are a risk factor for various other conditions. For example, high triglycerides are correlated with heart disease and stroke risk and are one part of metabolic syndrome—a collection of signs that mark a person as vulnerable to coronary disease and diabetes, among other ailments. In other situations, high triglycerides can be an indicator that an existing type 2 diabetes is not being controlled well. 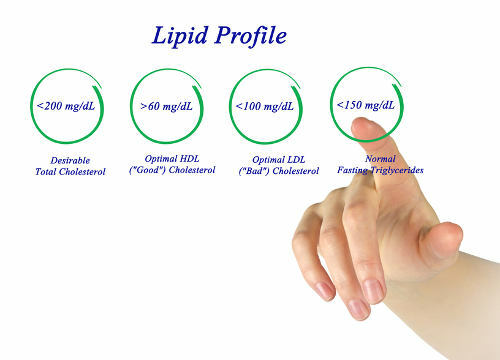 Basically, although triglycerides do not have as direct an effect as cholesterol, they are a known marker that is tied to numerous other health complications people are better off avoiding. For an overweight individual, losing anywhere from 5-10 pounds can reduce triglyceride levels by up to 20%. There are numerous ways to approach weight loss, from portion control to pure protein binges to brisk exercise regimes. Although diet and exercise are the most commonly effective ways to lose weight, the only universal constant is that an ideal weight loss method is sustainable in the long term. Experiment and find an approach you can stick to. Recall that triglycerides are used by the body to store calories. If you reduce the caloric content of your meals, even without significant weight loss, you can in turn lower triglyceride levels. A good way to accomplish this is by limiting your sugar intake, since sugar is a large source of “empty” calories. Keep an eye on the sugar levels in your ingredient labels and try to stick to only letting 5% of your daily calories come from added sugar. Assuming a standard 2000 calorie diet, this would work out to a limit of 150 grams (9 teaspoons) of sugar for men or 100 grams (6 teaspoons) for women. Interestingly, moderately low fat diets are more effective at reducing triglyceride levels than ones which are very low fat. It is actually recommended that people with high triglycerides get about 25-35% of their daily calories from fat, which is just shy of the 37% found in the average American diet. Veering away from saturated fats towards monosaturated ones and looking for fish high in omega 3 fatty acids (like salmon, mackerel, etc.) can also be a good approach. It can be easy to underestimate the impact alcohol can have on your diet, since we aren’t used to the idea of liquids being “substantial” in the same way that solid meals are. However, alcohol is high in both calories and sugars, so even a small amount of drinking can have disproportionate results. Abstaining from alcohol, or restricting yourself to one drink every few days, is advisable. Fish oil and niacin supplements are known to be able to help with triglyceride levels, but they are not suited for everyone. Fish oil supplements require large doses and niacin can cause interactions with other medication. Both options are also not very effective except in people who are in the “very high” range of triglyceride levels (500 mg/dL or 5.7 mmol/L). Do not take these supplements unless advised to by your doctor.